One - bring their FULL team to all future Spring Training games....Just kidding. The Miami Marlins need to quit whining. In all honesty, the Red Sox do still work to do before Opening Day on March 31 in Baltimore. 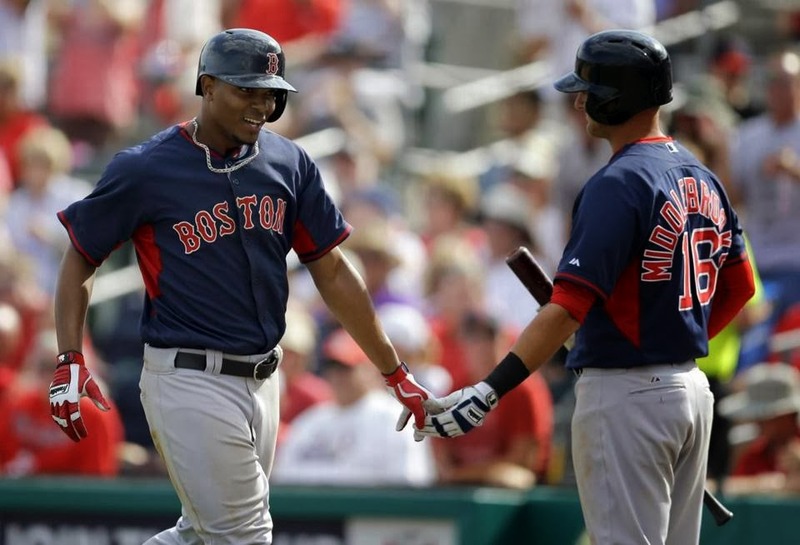 The Red Sox have only managed one Spring Training win in 7 games (1-5-1). True, these games don't mean anything and these games are a way to measure the young guys in camp, but there is still work to be done. Here are 4 of the things that need to improve before the regular season starts. 1. The shortstop position: The gap left by Stephen Drew has been on full display, especially in the 8-6 loss to the Cardinals. Balls that would have been outs with Drew got through Xander Bogaerts. You could put that down to his lack of experience, but that's something he'll have to overcome sooner rather than later if he expects to be the starting shortstop. Come the regular season, you could forgive the inexperience if he has a solid year at the plate. 2. Will Middlebrooks: Middlebrooks has also had his problems, both at the plate and in the field. Middlebrooks made 2 errors in the above mentioned Cardinals game, and unlike Bogaerts (.375 average), he's not having success at the plate. He's only hitting .100 so far at the plate in 10 at bats. Think about that - 1 for 10 and he's not playing good defense. That's the sort of thing that could result in him not being a regular starter at 3rd. In fact, according to the Globe, Deven Marrero did play good defense in the rain-shortened game against Miami, so he could end up being the shortstop while Bogaerts moves over to 3rd base instead of Middlebrooks. 3. The pitching: Individually, pitchers have pitched well, but collectively the pitching staff is not doing so well. The Sox have only allowed less than 5 runs once so far - the rain-shortened 0-0 tie yesterday against Miami. Other than that, they've allowed 8 runs 3 times, 7 runs once, and 6 runs twice. The pitching staff needs to step it up before opening day if they want to contend in the AL East. 4. Finding a secondary source of power: Mike Napoli and David Ortiz will probably be the big power guys in the heart of the order, but someone else farther down will have to provide some extra pop. Whether that be Daniel Nava or Jonny Gomes, or someone else, Nap and Papi can't carry this team offensively. Thoughts? Let me know on Twitter or leave a comment!